Are you getting tired of the same-old same-old for lunch? Had too much holiday leftovers? Here’s a lovely change of pace, especially for all you bread and cheese lovers out there: three very easy and quick recipes for two sandwiches and a soup! 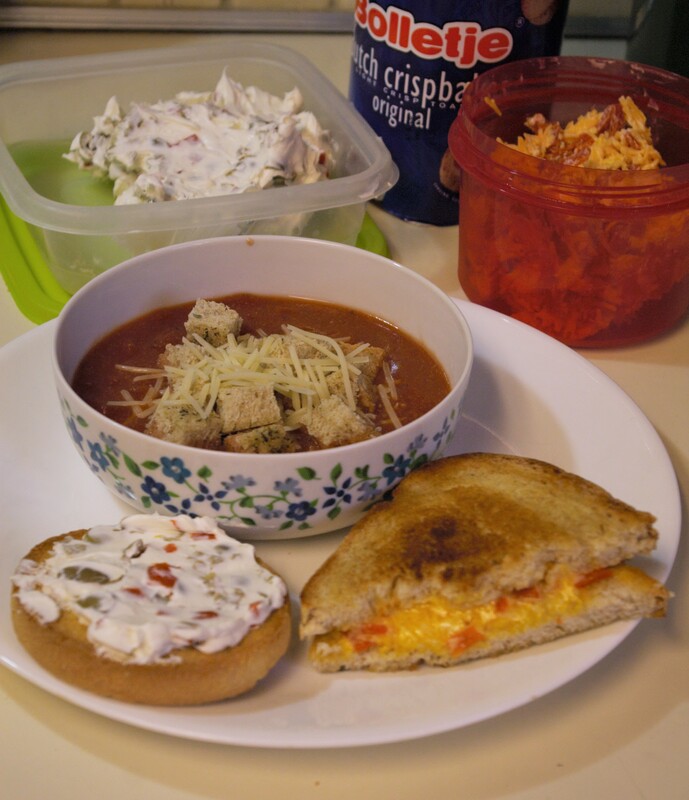 A plate with half a grilled pimento-cheese sandwich, cream-cheese & olive spread on a Dutch rusk (toast), and a bowl of tomato soup garnished with croutons and shredded Parmesan cheese. In the background are containers of cream-cheese & olive spread , pimento-cheese spread, and a container of Dutch rusks. “Salad olives” is the common labeling (in the US) of jars of sliced green Spanish olives stuffed with pimentos.These olives are great for adding to potato salad, and of course, making cream cheese & olive sandwiches. Scoop some cream cheese or Neufchatel into the mixer bowl, and add half that quantity of well-drained salad olives. Blend well, and spread on bread or crackers. It’s kind of a given that as a result from the slicing during processing, one ends up with a whole bunch of pimentos that have escaped their green olive rings. And you know what that means? You don’t have to buy a jar of pimentos to make pimento-cheese spread! Dump about a cup of shredded sharp cheddar cheese (that’s two or three handfuls) into the mixer bowl, and add about a fourth that quantity of well-drained pimentos, about as much mayonnaise as pimentos, and a dash of cayenne pepper. Blend well, and spread on bread or crackers. Great as a filling for grilled-cheese sandwiches. A cutting board with diced bread sprinkled with herbs. In the background is the jar of herbs, can of vegetable oil spray, and a loaf of home-made bread with a couple more slices cut. I made a loaf of bread the other day, but when I stuck it back in the breadbox, forgot to set it sliced-side down. So my first slice was rather dry. 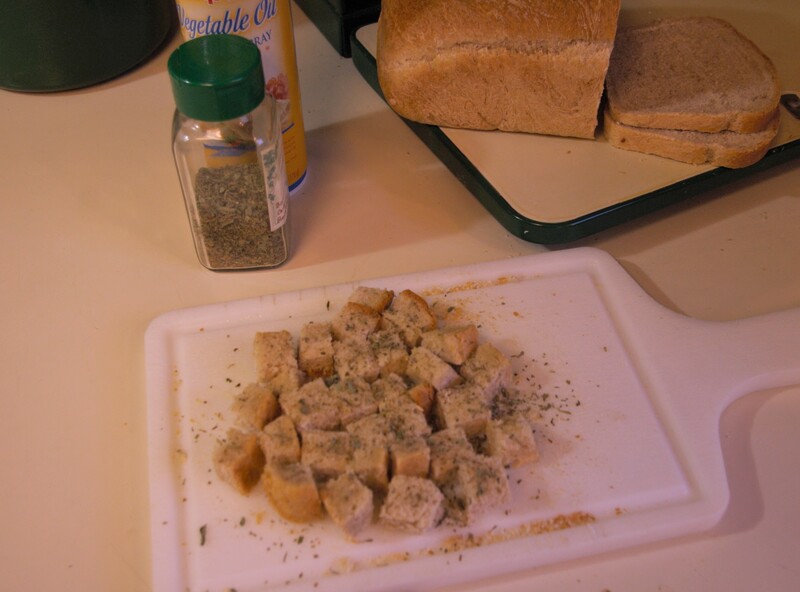 “Croutons!” said I, and diced the bread, then gave the pieces a quick hit of vegetable oil no-stick spray, and sprinkling of mixed Italian herbs. I dropped the croutons into a baking pan into the oven to bake while I made some tomato soup. Dump one can petite-diced tomatoes and one can tomato sauce into a pot. Add a dash each of Sriracha and Worchestershire sauces, and half a teaspoon of dried basil (a whole teaspoon of minced if you’re so fortunate as to have fresh basil on hand), plus a dash of black (or white) pepper. Bring to a simmer. Remove from heat, and before eating, stir in a bit of milk. Serve garnished with croutons and shredded Parmesan, as desired.